Hi Neighbor! 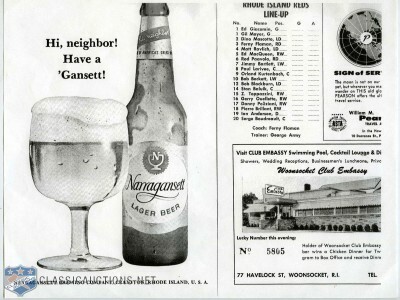 This vintage Narragansett Beer ad appeared in the Providence Reds hockey program during the 1960’s. The Providence Reds were a hockey team that played in the Canadian-American Hockey League (CAHL) between 1926–1936 and the American Hockey League (AHL) from 1936 to 1977, the last season of which they played as the Rhode Island Reds. The team won the Calder Cup in 1938, 1940, 1949, and 1956. The Reds played at the Rhode Island Auditorium, located on North Main Street in Providence, Rhode Island, from 1926 through 1972, when the team affiliated with the New York Rangers and moved into the newly-built Providence Civic Center. 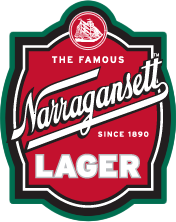 The team name came from the rooster known as the Rhode Island Red. The AHL returned to Providence in 1992 in the form of the Providence Bruins.